New Zealand’s vast unspoiled landscape is dominated by snow-capped mountains, glaciers, forests and an extensive network of pristine natural freshwater systems including mountain streams, rivers, lakes and springs. Beneath this landscape lies an extensive network of aquifers that are largely unexploited due to the plentiful clean surface water resources. Pure Kiwi Spring water is sourced from the Heretaunga Plains aquifer in Hawke’s Bay. This premium source of natural fresh water is fed by the Ngaruroro River and originates from rainfall on the beautiful, native bush covered Kaweka and Ruahine mountain ranges. 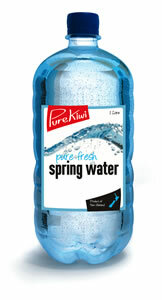 Pure Kiwi Spring Water is clean, pure and deliciously refreshing.